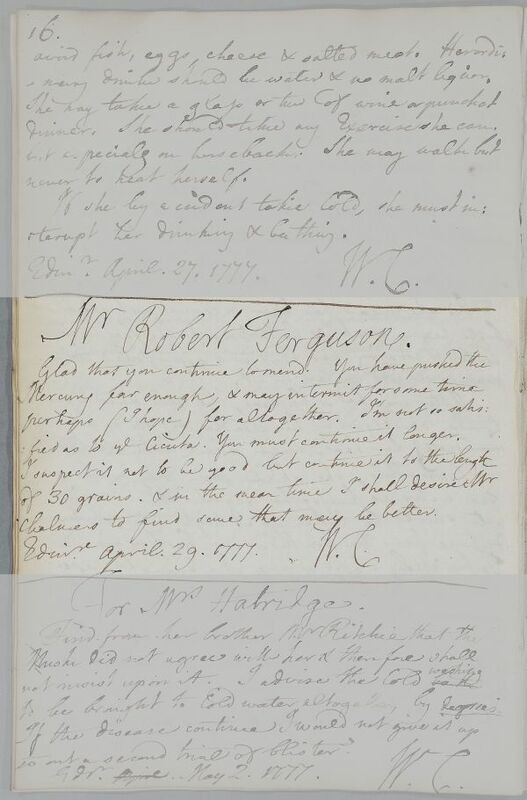 Reply, 'Mr Robert Ferguson'. Brief note in response to Letter ID 1398. Cullen says that Fergusson has 'pushed the Mercury far enough', but advises that the Cicuta may not be in a good state, and that he will ask Chalmers to find some better. Summary Reply, 'Mr Robert Ferguson'. Brief note in response to Letter ID 1398. Cullen says that Fergusson has 'pushed the Mercury far enough', but advises that the Cicuta may not be in a good state, and that he will ask Chalmers to find some better. Case of Robert Fergusson with a suspected venereal disease. Not obviously same patient as Case 935.
fied as to the Cicuta. You must continue it longer. Chalmers to find some that may be better. fied as to ye Cicuta. You must continue it longer.